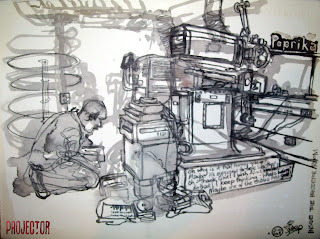 ANYway...The drawing commenced amidst Iain the projectionist's and the organisers' panicky flappings (very mildly pronounced!) about the lack of a film in it's case, some Strings, and the lack of a speaker, Francis McKee. All the while, the insanity and acid trip like state of the japanese animation 'Paprika', complete with screeching giant dolls and carnival cacophony was playing in screen 2 to a hypnotised audience. The cartoon most definitely represented the inner turmoil of those aiming to make things right in the face of adversity. Francis McKee's no show was dramatically reinvented into a panel of experts comprised of Nicolas Schmerkin, producer of Autour de Minuit, Jayne Pilling, founder and director of the British Animation Awards, and a shot of Bill Plympton for good measure. 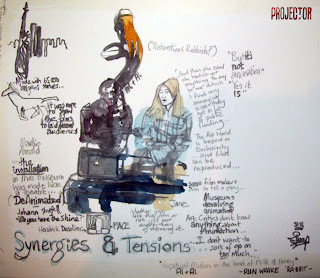 Since the original masterclass was going to be about 'The Tensions and Synergies' of animations made for the art gallery, and those made for the theatre/cinema, there was definitely a bounty of concepts, screenings and opinions up for the ravenous. From the creepy little animation by Al and Al 'Perpetual Motion in the Land of Milk and Honey', to the moralistic and acidic humour of 'Rabbit' by Run Wrake, interspersed with the heart thumping computer game styled 'Do you have the Shine?' by Johan Thurfjell based on Danny and his tricycle in 'The Shining', aswell as Hendrick Dusollier's horrific short 'Face', well people, it was an adrenalin fuelled event. I've never been as spooked , horrified, intrigued or irritated than I was during this session. Jayne questioned whether some artist's efforts were 'Pretentious Rubbish', but defended the validity of their films as animations - in particular Al and Al's when Bill Plympton felt the opposite. In his words 'You just think of the funniest stupidest things...But I try to make them poignant' which to an extent does describe a little of the mad, bleak, irritating, violent - downright pornographic at times - films. 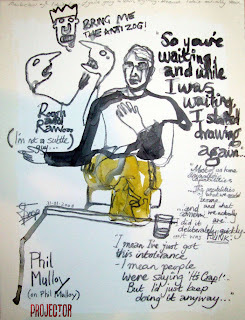 'Rough and Raw' might describe the digestability of them, 'Punk' might describe their ethos, but nothing can really prepare you for the assault on your senses that is an animation by Phil Mulloy. You might think I didn't like them. I really hated and loved them all in the same breath. I admitted to his amusement that I had been morbidly intrigued, even a bit embarressed at times. It's up to you to decide what you think. Try 'Intolerance' for size but perhaps not as your very first taste - 'The Christies' perhaps, or as Phil generously deposited into our laps, his version of 'The Sound of Music'. Fab drawings on these posts, they really liven things up! 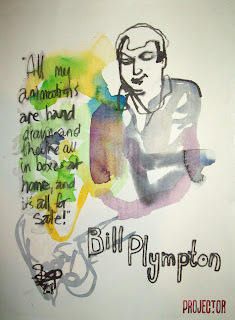 I love Bill Plympton! I wish I could have been there to see him! It's fantastic to be able to read about it here though!